BY NOW, MOST READERS OF REPTILES have either heard of or seen a picture of the piebald ball python. Those lucky enough to have seen a living specimen know of their incredible beauty. 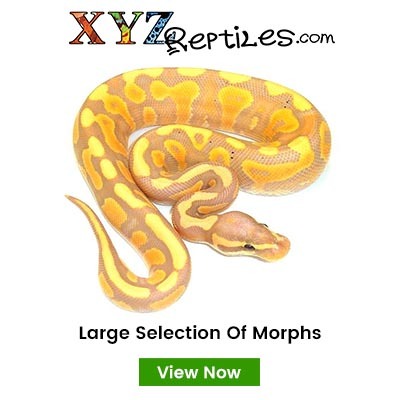 The irregular pattern that is splashed randomly on a snow-white background makes this naturally occurring color variant one of the most sought-after ball pythons. The ability for piebalds to survive in the wild to adulthood is truely amazing. The vivid coloration of these animals allows predators to easily spot and prey upon animals such as this. Piebald ball pythons have been recorded as early as 1966. Approximately 100 miles inland from Accra, Ghana, villagers found and killed a large male specimen measuring 118 centimeters. Further findings of piebalds could not be found until the early 1980s when Tyron Dillon of California Zoological Supply brought in two adult animals, also from Ghana. These animals were sold to collectors at prices ranging from $5,000 to $10,000. During the mid-1980s, the first baby piebald was imported by a dealer in Miami who sold it to a private collector, and the snake is now in our collection at Peter Kahl Reptiles. The explosion of herpetoculture in the United States during the early 1990s provided the demand for collectors in Ghana and Togo to mass collect ball pythons and their eggs. These large scale collecting techniques resulted in the finding of several piebalds that eventually found their way to importers within the states. Currently, there are 18 known piebald ball pythons within the United States and several rumored in Germany, Sweden and the United Kingdom. A heterozygous piebald ball python coils around her clutch of eggs! These patches may vary in size, shape and contrast. Piebaldism can occur in all animals, including humans. This unusual pigmentation can be an inheritable trait or it can occur ontogenetically. 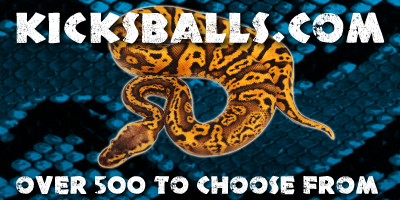 The type of piebaldism that our ball pythons have is an inheritable trait. We proved this was a hereditary trait at our facility during the 1997 breeding season. Fortunately, we were lucky enough to have one pair of piebalds breed and produce five eggs. All five hatchlings were piebalds with varying degrees of white and brown patches. With the knowledge of knowing that piebald-to-piebald breeding resulted in 100 percent piebald babies, would it be possible to have heterozygous piebald breeders produce piebalds? We answered this question last year when heterozygous piebald ball pythons that we produced in 1995 were bred together and produced piebalds. It's hard to argue the beauty of this naturally occurring color variation of ball python. Note the double line striping within the gold coloration. The first purchase was the snake mentioned earlier in this article, a male imported as a baby, raised to adulthood and purchased from Brian Sharp. This specimen is the only known reproductive male in existence. Several female piebalds were found in the United Kingdom and with help from David Feldmar of the Prestige Herp Breeding Centre, we were able to acquire these animals. Now that a small group has been established, questions about whether this mutation was an inherited trait arose. Several factors gave strong evidence to this possibility. The first clue was that all the animals phenotypically appeared the same. That is, their physical appearance was very similar. All of the animals had varying degrees of white and brown patches, but within the brown areas there were two black stripes. This double-line striping can be found on all of the existing piebalds. The second clue was the fact that collectors have known of piebalds for more than 30 years, and if this were a totally random mutation, not as many specimens would have been found. The final clue was when Noah, owner of Greyhead Enterprises in Ghana, hatched two female piebald offspring from the same clutch of eggs. When we learned of this, we were even more sure it was an inheritable genetic trait so we purchased those females from Noah to increase our total number of piebalds to six. Images like this are what make captive breeding truely rewarding. This clutch was produced from a heterozygous x heterozygous breeding, resulting in two piebalds and two possible hets from four eggs. 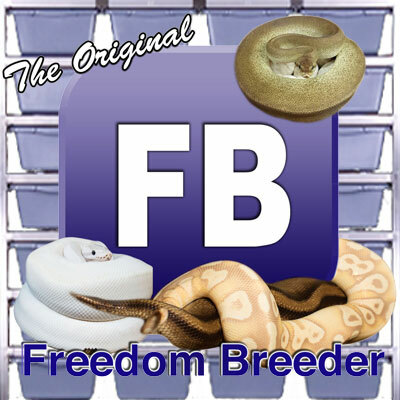 The breeding project started in 1995 by breeding the male piebald to several normal females. All of the offspring were held back to be raised for further breeding. Remember, at this point were still unaware of whether this form of piebaldism was genetic or not, so we either had several heterozygous offspring or just a bunch of normal ball pythons. Finally, in 1997 our female piebalds were old enough to be included in the project. After watching the male piebald copulate with our females for three months, our largest female started to exhibit the behavior of a gravid ball python. In our experience, gravid females build nests underneath cork bark shelters or plastic hide boxes. They construct circular areas by pushing mulch aside and lying in an inverted coil with the ventral scales facing up. This observation is a firsthand marker that the female is in a reproductive stage. Palpating the female, a technique where fingers are pressed gently into the abdomen and the snake is encouraged to crawl forward so that the fingers run the length of the snakes body, showed that she had five developing eggs within her. This, of course, was very exciting for us, and our anticipation ran high. The wait was brutal. Finally, after 55 days from the ovulation date, she laid five perfect eggs! We placed these eggs in a Bush Herpetological incubator equipped with a Helix climate controlled system. As the days crept by, our curiosity was driving us mad. We were in the process of building our new facility, bills were accumulating rapidly, and orders for heterozygous animals had to be placed aside until we were sure that they would hatch out as piebalds. A normal-looking (heterozygous) ball python is shown with a beautiful piebald specimen. After a long debate, we decided that we had to find out what lay beneath those little leathery shells. Careful hands worked the scissors as the first snip of an egg occurred. Each snip of the shell revealed more of the baby snake that lay inside. Finally, a window large enough to see inside the shell was cut, and nothing but silence filled the room. Then, screams from both of us rang out: "It's genetic!" That day was definitely one of the most exciting days for both of us in our reptile breeding careers. From that day forward, we knew that there would be exciting and new hatchlings produced during the years to come. During the 1998 breeding season we produced several piebalds, heterozygous for piebalds and possible heterozygous for piebald offspring. Possible heterozygous offspring are obtained by breeding heterozygous to heterozygous breeders or heterozygous to normal breeders. We produce these genetically unknown animals to enlarge the genetic diversity of our project as well as to offer an inexpensive alternative to starting a breeding project such as this. Currently, we are involved with research on developing a test to determine the genetic makeup of possible heterozygous animals. If this test is perfected, we will be able to draw blood from a given animal and test to see if it is a genetic carrier for the piebald trait. These piebald ball pythons have varying degrees of white throughout their bodies. Patterns can vary in color, and as further outbreeding occurs, variability will increase. So far, no two have been the same. All of them exhibit the traits mentioned previously, but pattern shape, the amount of white and coloration vary. With so many different ball python variations being introduced to the herpetoculture market, the possibilities seem endless. Who knows what will happen when you breed a caramel, or an albino, or even a pastel jungle to a piebald? Only time, skill and luck will tell. One thing is for sure: There is a dire need for the captive propagation of all ball pythons. An estimated 45,000 ball pythons were imported from Ghana and Togo into the United States last year. This number does not include ball pythons shipped to other countries around the world. This mass collection has a detrimental effect on not only the species as a whole but the surrounding ecosystem with which ball pythons live. The infamous reputation ball pythons have obtained for being poor feeders is accounted for because of wild-caught parasite-filled specimens. Captive-bred specimens, when maintained under the correct conditions, thrive to be healthy problem-free snakes. The consumer can expect to pay a higher price for a captive-bred animal, but in the long run it will be worth the extra money spent. In addition, breeding ball pythons is easy, does not require a lot of space and, if a baby snake can be considered cute, these little hatchlings definitely are!! THERE ARE SEVERAL BALL PYTHON specimens that possess a complete white band around various sections of their bodies. These piebald-looking animals differ from the animals with double-line stripping patterns. The pattern appears normal until the banding, which contains some irregularities. We believe this type of piebaldism may differ genetically from those that we are producing. The banded variety may only produce branded offspring instead of complete piebald-looking specimens. This banding form could also be located on a different genetic marker, resulting in normal-looking animals when bred to the double-line stripe variety. All of the offspring from this reproduction would be double heterozygous for both forms of piebaldism. We are currently working with Kevin McCurley of New England Reptile Distributor to see whether these two phenotypically different snakes are genetically compatible. Kevin owns the banded form pictured here and has this snake on breeding loan at our facility. Hopefully, the 1999 breeding season will determine what type of offspring will result when these two specimens are bred together.